Description: GRANVILLE./<>OHIO.<> Oval 32x27mm, ms May 25, (1833), S. Wright Postmaster Free Frank; to New York City. Description: CSA #11 on cover postmarked MORTON, MISS., JUL 29 sent to Thomasville, Georgia. Description: CSA #7 pair on cover postmarked RICHMOND, Va., JUL 26, 1862 sent to Cross Rock, NC. Early date for issue. Description: 1861 1c blue (#63) tied by "Boston Ms. Paid Jul 25 1862" circular datestamp to long wrapper to Barton, Vt., printed matter rate. Description: HARTFORD. * A•T/12 rimless 22mm postmark with (August 12, 1794) 12-1/2¢ Rate of 1794 (100-150 miles) on folded letter to New York. 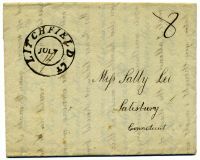 Description: HOTCHKISSVILLE/CT., Litchfield County, 27.5mm Black December 25, (1856) tying Scott #10 to Waterbury; CHRISTMAS DAY. 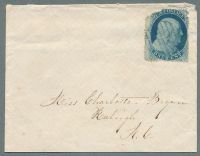 Description: CSA #12 on cover postmarked green LYNCHBURG Va., JUN 20 sent to Pedlar Mills, Va. Original letter accompanies cover. Description: CSA #11 on cover postmarked blue PETERSBURG Va., SEP 2 sent to Winterpock, Va. Description: US #65 on cover postmarked double circle OMAHA CITY, NEB., AUG 29, 1864 with matching target cancel sent to Dunkirk, New York. Description: US #10 on folded 2+ page letter postmarked red CHARLESTON S.C., 3, AUG 1 with matching grid sent to Erwinton, SC. Description: PUTNAM/CONN. 27mm 3PM/FEB/3 pmk with 'Four Square' Cancel tying 2¢ Bank Note to Westford, CT; S. H. Seward Counsellor-At-Law Corner Card. Description: PUTNAM/CON 26mm JUN 5, (ca.1866) pmk with Double Anchor Fancy Cancel tying Scott #65 to Rhode Island; Skinner-Eno PO-An 14, Ex-Boyarsky. Description: PUTNAM/CON 26mm NOV 7, (1866) pmk with Positive'US' in crude frame Fancy Cancel ties Scott #65; Skinner-Eno PT-C23, with enclosure. Description: DERBY/CT., New Haven County, 26mm FEB/18 (1871) CDS Large Positive 5-Point Star Fancy Cancel on Scott U82, to Chateaugay, NY. Description: ROCKVILLE/CT., Tolland County 24mm May 24, NYD CDS with Heart-In-Circle Fancy Cancel S-E Ph-H 13 on Scott #94, Rare. Description: WILLIMANTIC/CON, Windham County, 30mm Black Octagon May 15, 1865 date stamp on local drop rate cover.